$50M from Canadian taxpayers, borrowed $$–no you were not asked, nvr will be–to fund more #Agenda2030 in hopes of buying a UNSC seat. Here’s the latest news from the People’s Party of Canada. Pundits were saying it was impossible. But we’re doing it! 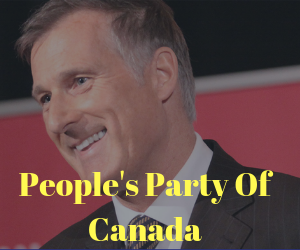 It’s only been two and a half months since our party was launched by Maxime Bernier, on September 14, but we’ve made tremendous progress since then. The People’s Party now has almost 33,000 members, and about 260 interim Electoral District Associations (EDAs) have been established. We expect to have all 338 EDAs set up in the coming weeks. If you are a member of an interim EDA board of directors, you should have received a memo explaining what can and needs to be done until the party and your EDA are officially registered by Elections Canada. Among the priorities is selling more memberships to make sure that your EDA gets even bigger and stronger and can count on more volunteers to help you spread the PPC message until the elections next October. Our leader Maxime Bernier has been touring the country and holding rallies in different cities. He first went to Vancouver, Calgary, Toronto and Gatineau. This past week, he was in Winnipeg and Saskatoon. Hundreds of supporters went to each of these rallies to listen to his message about doing politics differently. You can watch his Winnipeg speech here. The next rallye will take place in Quebec City on December 6. Check the details here. Parliamentary rules allow PPC leader Maxime Bernier to ask one question about every ten days during Question Period. He recently asked the government a question about C-69, a bill that will make the construction of pipelines and other major projects even more difficult (see here) and another question about the Global Compact on Migration, a dangerous UN treaty that Canada is about to sign whose objective is to normalize mass migrations (see here). Forward this PPC newsletter to your friends, colleagues and family members, and invite them to sign up on our website to receive it. Let’s continue to work for Freedom, Responsibility, Fairness and Respect! Maxime Bernier, Independent MP, Beauce. To make a donation with a cheque, please use this address: 290, St-Joseph Blvd, room 205, Gatineau, Quebec, J8Y 3Y3. The cheque must be made payable to Christian Roy, Official Agent. To make an online donation, please visit our website:www.maximebernier.com. Thank you! PLEASE NOTE: No tax receipt can be issued for donations until the party is officially registered by Elections Canada.